In late May, I planted my Veg-trugs. Veg-trugs (available from Lee Valley Tools, Halifax) are small portable garden troughs perfect for a deck garden. As you can see, all are up. The maple seeds around each plant will sprout and will take lots of time to remove. I’ll update on progress as the summer unfolds. The final manuscript of poetry from my ‘harvesting colour’ project is due at the end of October. However, I don’t think these adventures with using natural dyes are ending. 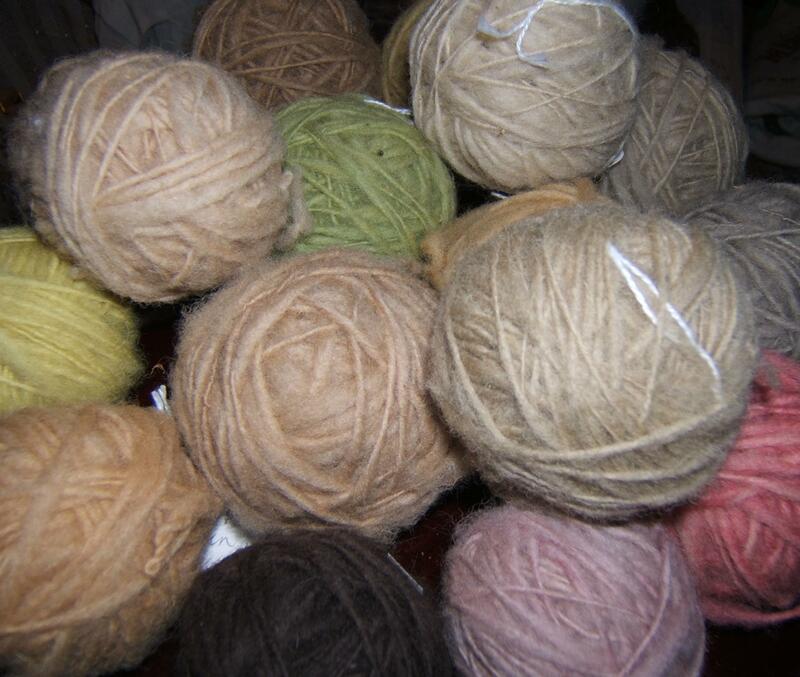 I have enjoyed this project so much and I am so proud of my basket of home-dyed, hand spun yarns. 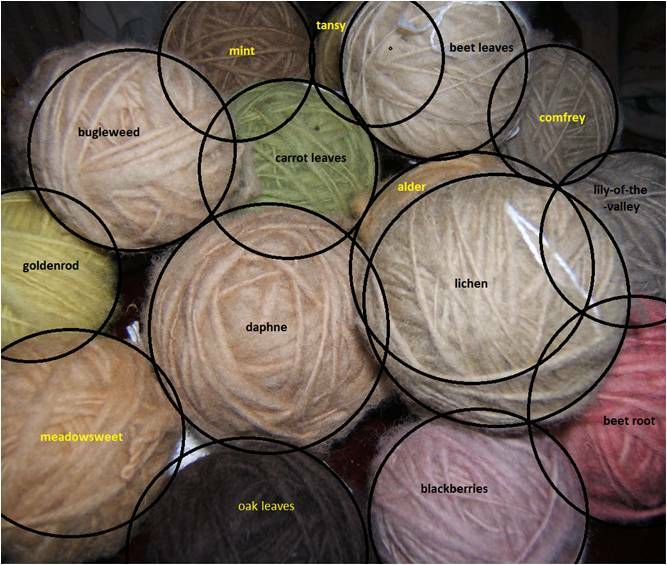 I took a step towards next year’s batch of yarn by thinking about starting a dyer’s garden (so many of the interesting plants I have read about are not available locally). I would love to try growing some of those traditional medieval-sounding plants in my dyeing. Weld, Woad and Woadwaxen – don’t they sound almost magical? 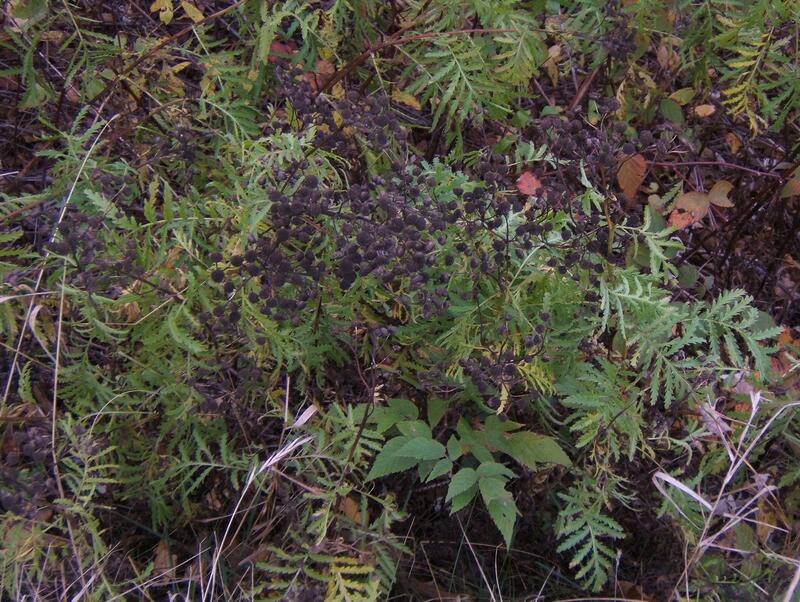 Most of the plants used through the ages for dyeing have the species name of tinctoria, tinctorius, tinctorium, or tinctorum (from the Latin tingo, tingere – to dip, to soak, to dye). 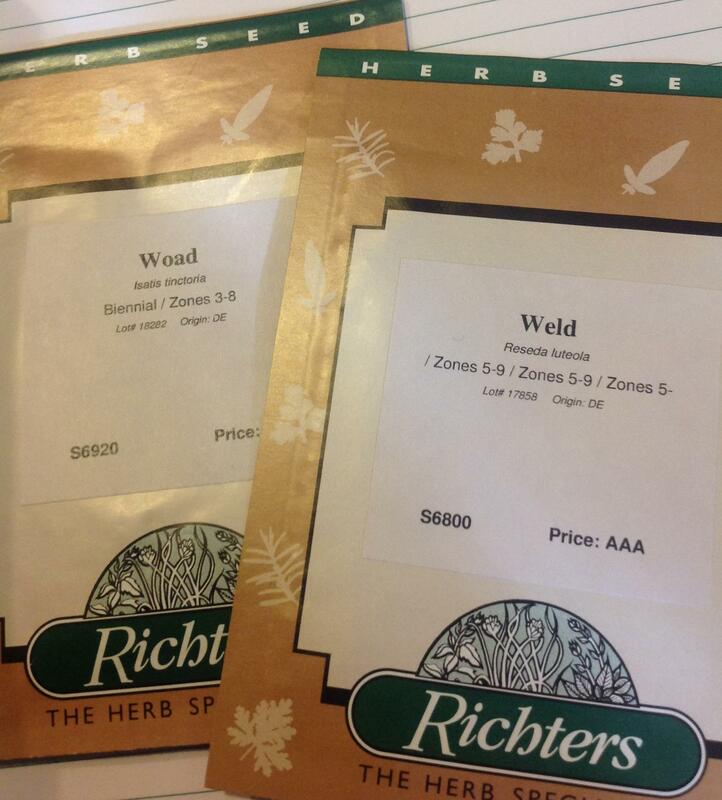 To begin with, I sent to Richters Herb Specialists ( https://www.richters.com/ ) in Goodwood, Ontario for Weld and Woad. And I have Rita Buchanan’s book A Dyer’s Garden to help me get the best results. Well, the seeds have now arrived. Next spring I’ll find a sheltered spot with the right conditions and try to grow these two. I listen to the tiny seeds shaking in their packets and wish for May. Roaming around the countryside, the weekend before last, deluged by color from orange and yellow trees and crimson fields of blueberry, I was interested by the contrast in the ditches. A month ago, they were a riot of yellow or purple as the goldenrods, tansies and asters presented themselves, species by species. Now, they are done with blooming and are in the business of releasing their seeds. To attract pollinators for setting their seeds, flowers put on a competitive display of color and form. But dispersing their seeds is a different process altogether. 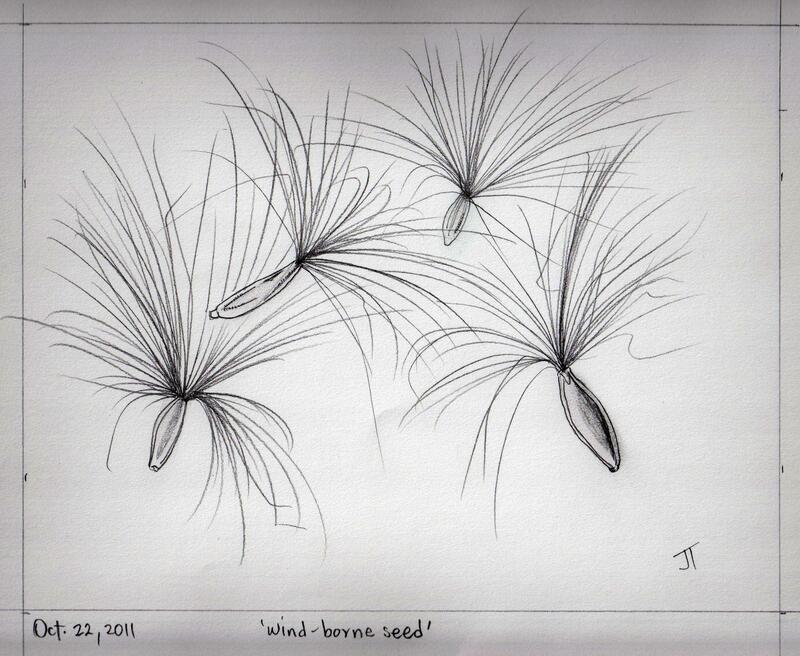 Many depend on the wind to carry their seeds to ideal sites for next year’s bloom and the wind is color-blind. 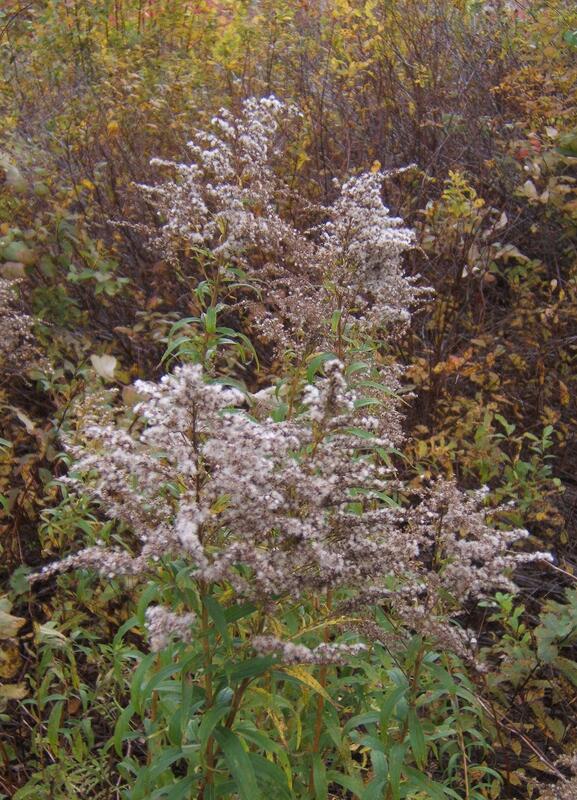 Grey, white and even black are the dominant colors in the ditches. Seeds dispersed by wind either flutter to the ground, or float in the air. Often, they are assisted by a special seed form. For example, maple keys are flattened and aerodynamic so they spin and travel some distance as they fall. Seeds of goldenrod and aster have feathery white bristles (called the pappus, a modified sepal) to help them float through the air. The term pappus comes from the Latin pappus meaning ‘old man’, an apt description of the white heads of the flowers, gone to seed. Another species in the ditch, Common Tansy (Tanacetum vulgare L.), also known as Golden-buttons, ordinarily has bright yellow flowers in a flat head. 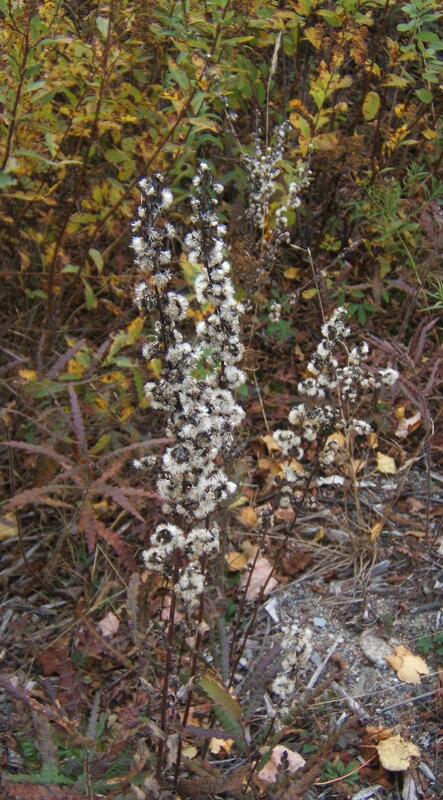 Now, it has joined the black and white revue, showing black seed-heads against feathery leaves. The seeds of Tansy, in a form called an achene, have no special adaptation for flight. This time of year, these seeds are dry and ready for dispersal by gravity.